Zero interest rates are creating expensive asset prices and the lemmings are out in force. The latest addition to the Australian Fund lasted just three weeks. Former darling is once again in favour with fund managers. Everyone bailing out of China gave the Fund an opportunity. It has been a volatile and busy quarter for the Forager investment team. Some old investments have made way for new and an old employee has done the same. Value investing is supposed to be a staid business, identifying attractive investing opportunities and holding them for years. But when the share price of a company you are interested in halves and then doubles in the space of a few months, one must get busy. And busy we have been. I don’t have any figures to back this up, but I would guess the first three months of 2016 saw us do more trading than during any quarter of the past six years. The shares of South32 (ASX:S32), a company with a rock solid balance sheet and some of the world’s best mining assets, closed at $1.065 on 31 December 2015. They traded down to $0.89 on 21 January and then rallied 85% to $1.65 on 14 March. On 8 March, 121 million shares changed hands, more than 2% of the company’s total shares on issue. There wasn’t much of note to report during the period. Most commodity markets remain oversupplied and there seems little prospect of a meaningful change in the short term. At a briefing breakfast after reporting its half year results, South32 CEO Graham Kerr said they will need at least 12-18 months of low prices to permanently remove excess supply from the market. We’re not complaining. Keeping busy has been very profitable (see Whitehaven Coal (ASX:WHC) and South32 in the sections below). But what is driving such extreme share price volatility? And should we be concerned? Without professing to understand the madness of crowds, there are a couple of clear themes influencing the current market environment. First, there is a lot of money looking for a home that isn’t a zero-interest bank account. Rare Ferraris are selling for €32m, Picassos are selling for $US179m and dingy one-bedroom apartments in Sydney go for more than a million bucks. These are not unrelated events. Cheap money is causing all sorts of distortions in global asset prices. It is very clear that, after seven years of experimentation, ultra-low interest rates are not having the desired impact on global economic growth. Monetary policy is a very blunt and ineffective tool and, without help from sensible fiscal policy, it cannot single-handedly rescue the world. What it can quite clearly do is create asset price distortions and the sorts of wild market swings we have seen this past quarter. And yes, this aspect of financial market volatility is worth worrying about. The second factor is as old as financial markets themselves – the propensity for investors to crowd into small pockets of the market where they feel they are safe (usually those pockets that have performed well in the recent past). One of our investors asked me a few questions about an unrelated hedge fund earlier this year. My brief observation was that the performance was excellent but that there was nothing hedged about it. The fund in question falls into the “market neutral” category, where the manager tries to offset their long positions with an equivalent amount of shorts (bets that share prices will decline). The idea is to make money irrespective of the overall market’s movements. For example, you might go long a selection of stocks and short the whole market, or long Commonwealth Bank (ASX:CBA) and short ANZ (ASX:ANZ) because you think the former is more attractive. 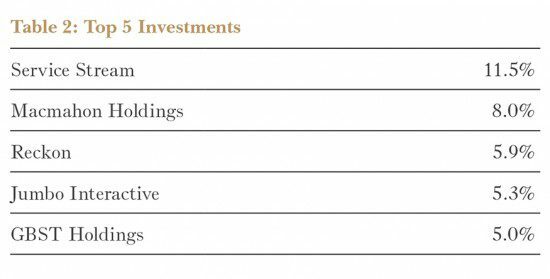 The asset allocation diagram for this fund showed that it was short mining companies and long every other sector. There is nothing wrong with that, it was the right call in 2015 and explains the excellent performance. But it is a leveraged bet on the theme, not something that should be marketed as “neutral”. As a final check I went and took a look at a few of the hedge fund’s direct competitors in the market neutral space. They have all been having a merry time of it (hence the proliferation of market neutral LICs of late). And, surprisingly to me, they all had exactly the same market positioning. Short mining, long everything else. The homogeneity of the strategy explains a lot. When everyone is crowding into the same small parts of the market, you can see wild swings in the prices of reasonably large stocks like South32. The volumes and magnitude of the rallies in South32 and Whitehaven looked to me like hedge funds desperately needing to unwind their bets, all of them at the same time. Lemming-like behaviour is nothing new in financial markets, but it does seem more pervasive than ever before. Those companies in favour – particularly good businesses with growth prospects – are extremely expensive. Those out of favour can get absurdly cheap. Finally, I was fascinated by the fact that, from what I could tell, not one of the funds I looked at had taken their profits on their mining shorts. I am as bearish on China as anyone, but the share prices of companies like BHP Billiton (ASX:BHP) and Rio Tinto (ASX:RIO) were starting to factor in a particularly bleak future. It’s very easy to fall in love with a winning strategy. At the depths of the financial crisis in 2009, GMO’s Jeremy Grantham wrote that the few brilliant souls who went into the financial crisis with large cash weightings would “not want to easily give up their brilliance”. It is not that different when you have been short mining and short China and seen that strategy pay huge dividends. To turn around and buy the same stocks you have been publicly avoiding requires overcoming some very strong emotional biases. Perhaps putting RNY Property Trust (ASX:RNY) to one side (see section below, ‘RNY stuck with no hipsters in sight’), our efforts at overcoming this inertia bias are something I am extremely proud of over the past year or so. We have forced ourselves to look in maligned parts of the market and materially improved our portfolios as a result. Hopefully you received our email earlier in the quarter but I want to add another farewell to Australian Fund analyst Matt Ryan in this quarterly report. Matt has decided to pursue a career outside the funds management industry and we wish him all the best. He’s been a huge part of the Forager Australian Shares Fund’s success over the past four years and will be missed by all of us (me most of all). Matt’s replacement, Daniel Mueller, will be starting in the Forager offices in late April and will be introduced to you soon after. While on the topic of staff, we are still considering adding another analyst to the team to work on the International Shares Fund. We have heard from lots of great candidates but haven’t found exactly what we are looking for. So we are still open to hearing from candidates. Send a CV through to [email protected]. It is very clear that, after seven years of experimentation, ultra-low interest rates are not having the desired impact on global economic growth. There have been some big changes to the Forager Australian Shares Fund during the March quarter. Some long held companies have excelled, some have disappointed and a new stock has enjoyed a very short stay. That’s a made up version of a real conversation. Our February report contained some bad news about some of our core holdings (most importantly, see ‘RNY stuck with no hipsters in sight’ below). This is not an unprecedented event. Successful investing has two components. Part one, accurately identifying the value of a company and buying it for significantly less than that valuation. Part two, holding on to it until the gap between the two closes. We are constantly receiving information, like half yearly results, that helps determine whether our valuation is correct, too high or too low. Results received in February suggest some of our valuations are too high. But we also saw the values of other core holdings affirmed and, importantly, increasingly reflected in the share price (see ‘Market comes full circle on Service Stream’ below). Over the long term, getting the valuations right is what counts. The sooner the better, of course, but if we are right on valuation the gap will eventually close. Over the long term, getting the valuations right is what counts. The sooner the better, of course, but if we are right on valuation the gap will eventually close. Which is why, despite share prices going up, it was a mildly disappointing reporting season. There will be periods where exactly the opposite happens. Results can be good, our valuations correct, and share prices fall even further. When that happens, we’ll tell you we are doing well even when you can’t see it in the unit price. First purchased in 2010, RNY Property Trust has been one of the largest holdings in the Forager Australian Shares Fund for more than five years. Until recently, it was also one of the most significant contributors to the Fund’s excellent performance over that period. The trust owns a collection of US office properties in New Jersey, Westchester and Long Island, areas within commuting distance of Manhattan. Buying in the aftermath of the financial crisis, our thesis was threefold: that the huge gap between RNY’s unit price and its net tangible assets (NTA) would narrow; that the NTA itself would increase as the US economy recovered; and that buying assets in the US was a good idea with the Australian dollar at better than parity with its US counterpart. The Aussie dollar has fallen and, in 2012, management were able to arrange some advantageous debt relief, increasing the NTA. But, despite robust employment markets, the underlying asset values had failed to budge. In fact, according to the last results release, they have fallen. In some cases that fall has been precipitous. The Trust’s office property at 100 Executive Drive in New Jersey was on the books at almost US$12m six years ago. Today it is apparently worth $4.1m, a 66% decline. Two nearby properties have seen their values fall by almost as much. In total, the remaining properties are worth 30% less today than their December 2009 valuations, and it remains to be seen whether the updated values can be realised. In a world of zero interest rates and skyrocketing prices for every asset imaginable, this is disappointing to say the least. After waiting years for Manhattan’s optimism to spread to the suburbs, it’s time to recognise that there is a problem. 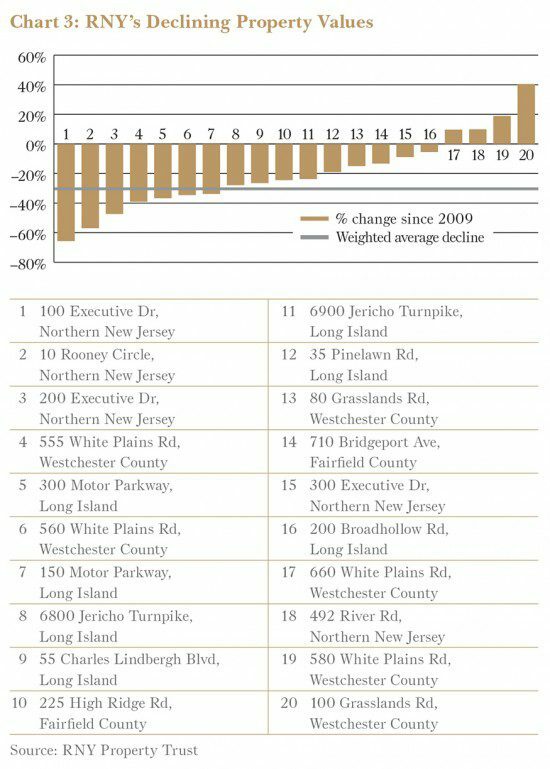 That problem is that companies increasingly don’t want to rent space in RNY’s suburban office properties. New generations of workers want to work in a highly urban environment. Whereas 20 years ago, living in the suburbs and being able to drive to work was seen as an advantage, today’s workers want to live in the city. Even those whose employers can’t afford an office in Manhattan want to live in neighbouring borough Brooklyn and commute back out to the suburbs. So the gap between CBD office rentals and suburban office space has widened into a gulf and, even within the suburbs, offices easily accessible by public transport are commanding massive premiums compared with those, like most of RNY’s, that aren’t. The net result is that occupancy levels at RNY’s office buildings have slipped to a weighted average of 75%, well below the historical average of 90% used in RNY’s valuation models. With the trend looking more secular than cyclical, the values quite clearly needed to come down. You would think that one of the advantages of selecting a fund manager who enjoys the inner city lifestyle himself is that he could at least work out what his comrades are up to. If you are looking for someone to blame, look no further than us. It is our job to identify and weight secular issues like this. And you would think that one of the advantages of selecting a fund manager who enjoys the inner city lifestyle himself is that he could at least work out what his comrades are up to. We’re still hoping for a decent outcome. Management claim the revalued asset backing of US$0.26, well north of the current unit price of $0.115, represents a realistic estimate of the liquidation value of the assets. And they have indicated that the properties could be sold and the trust wound up within 12-18 months. With lots of leverage and no real evidence of a liquid market for the assets, though, it is hard to have any conviction. Through 2010 and into early 2011, utilities contractor Service Stream (ASX:SSM) was one of the ASX’s darling stocks. Although Kevin Rudd no longer had his job as Prime Minister, the Rudd government’s 2007 election promise of a National Broadband Network was finally becoming a reality and Service Stream was to play a key role in its delivery. A $107m loss in 2013 put paid to the optimism. Far from being a source of growth, round 1 of the NBN turned out to be a life threatening calamity for the company, as fixed price contracts were unable to be profitably delivered. 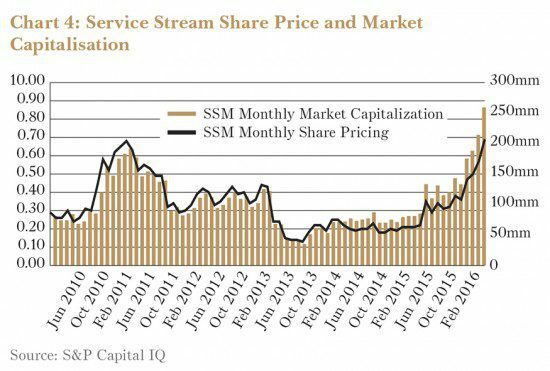 Service Stream’s market capitalisation fell from more than $200m to less than $40m and an emergency capital contribution was required to ensure the business’s survival. The Fund acquired most of its position in that capital raising. It spent the next couple of years in the institutional investor dog box. “Ye shall not be spoken to”, say the institutional investors, “until you serve your time for the sins of the past”. You may think it no bad thing being left alone to run your business and we tend to agree. We encouraged the new management team to forget about the market and use the peace and quiet to get on with returning the business to sustainable profitability. That they have done an excellent job of. And, while we would be perfectly happy for the company to remain in the nirvana state of increasing profits and low expectations, fellow fund managers are finally starting to take notice. Wilson HTM became the first broker to recommence coverage on the stock earlier this year, the volume of shares traded has increased dramatically and the share price has almost tripled in the past 12 months. While we would be perfectly happy for the company to remain in the nirvana state of increasing profits and low expectations, fellow fund managers are finally starting to take notice. We are now left with some difficult decisions to make. The expectations on the company are still undemanding. It is due to return $0.05 per share in capital in May and it could be worth more than $1 a share if the next 24 months go to plan. In fact, it is the stock in the portfolio we are most confident can grow revenue and profit over the next few years. The portfolio weighting has increased with the share price, though, and at one point was approaching 15%. That’s too much for a stock with a decreasing margin of safety. Roughly a third of the fund’s holding was sold in March and you should expect more to be sold if the price continues to rise. 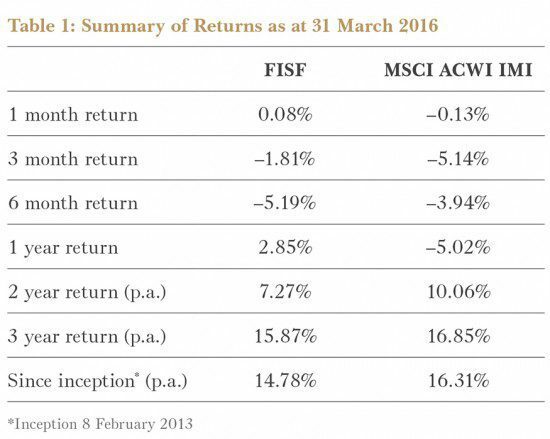 The typical holding period for the Forager Australian Shares Fund is roughly three years. Sometimes we will hold a stock for a lot longer than that (several of the fund’s current holdings have been part of the portfolio since our first year of operations). The philosophy is simple. We buy a stock when we think it is trading at a meaningful discount to our valuation of its future cash flows. We sell it as the market starts to recognise that value and the security’s price approaches fair value. That can take a long time. Or it can take three weeks, as in the case of the recently bought (and sold) Whitehaven Coal. Whitehaven’s two main assets are long-life and low-cost coal mines in Narrabri and Maules Creek. The former has a remaining life of at least 20 years and the latter has only just begun operations and has at least 30 years to run. Whether the world is going to need its production in 30 years’ time is questionable. What’s clear is that there is too much coal being produced in the here and now. Consultancy Wood Mackenzie reckons an extraordinary two-thirds of the world’s coal is currently being mined at a loss. The solution to the industry’s woes is to shut those mines that are losing money but, thanks to state-owned mines running at a loss to save jobs and high sunk costs relative to ongoing operational expenses, that hasn’t yet happened. Whether it takes one, five or ten years for the adjustment to take place is not something we have a strong view on. What we are interested in is the optionality Whitehaven provides on the adjustment happening soon enough for the company to survive. The company’s survival is not imperilled by the quality of its assets. Whitehaven is in the one third of the industry that is profitable even at today’s low prices. Rather it is the debt that was used to develop Maules Creek that is the problem. The company owes $925m in net debt. That doesn’t look much next to $4.2bn of assets but, relative to the $60m of earnings before interest and tax it earned in the six months to 31 December, it is looking stretched. The first big test comes when it must meet covenants for the first time in December this year. If the coal market has deteriorated further, the company will likely be in breach and its future in the hands of its bankers. All of that explains why the share price had fallen from north of $7 in 2011 to less than $1 prior to Christmas. Only time will tell how the Whitehaven option plays out and we might get a chance to own it again. For now, we’ve banked a lucky profit. We first took a look at around the $1 per share level and fairly quickly dismissed it thanks to too much debt and not enough potential upside. We took a more detailed look at $0.60 and still decided not to pull the trigger. In the market panic of January and early February, however, we decided that the price of less than $0.40 was too good to refuse. To understand why we would buy a company that might go bust, you need simply to understand the upside. At a price for thermal coal of US$50 a tonne, the company is barely profitable. At $70 a tonne, a level at which much of the rest of the industry is still unprofitable, our estimate of value is a little over $1 a share. At a more optimistic $100 price level, Whitehaven could be worth $5. That scenario is unlikely in the foreseeable future, but you can see how sensitive the valuation is to relatively small movements in the coal price. So we bit the bullet and took a small position in a stock where a possible 100% loss is more than offset by the potential to make four or five times our investment. The stock doubled within three weeks of purchase. It is important in these high-risk situations to make sure you profit sufficiently from the winners. We will lose money from time to time and, if we cash our chips in early on every winner, it is going to crimp our average returns. But this scenario is unique in that absolutely nothing has changed. Usually the price has moved because a company is more or less likely to survive. If the odds have improved, it might pay to hang on to your lottery ticket. In this situation, the odds didn’t change in the three weeks we owned it. In our opinion, it is just as likely to go bust as it was a couple of months ago. So a doubling of a share price simply put us back where we were late last year – too much downside and not enough upside from the $0.77 share price at which we sold. This quarterly review outlines some important changes to the portfolio, chiefly that the Fund’s shift towards smaller stocks is likely a permanent feature. We also offer a mea culpa and outline one of the Fund’s attractive new investments. We had a few objectives at the time of launch in February 2013. Firstly, to take advantage of the strong Australian dollar (buying more than one US dollar at the time). Second, to give our investors the opportunity to diversify away from the China-dependent Australian economy. And, third, to do so in a relatively low-risk way, by holding a number of global blue chips and cash where we couldn’t find compelling opportunities to invest in. There have been some wobbles along the way. Almost from the day we launched the fund, stock prices in the key markets of the US, Europe and the UK went up, and kept going up. That left us frustrated and sitting on our hands waiting for opportunities. Our investments in oil services stocks have been expensive, offsetting the gains from a few stellar performers like Betfair (LON:BET) and Madison Square Garden (NYSE:MSG). 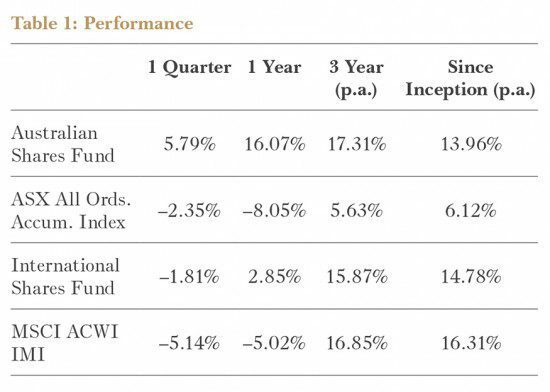 You would have made slightly higher returns invested in an equivalent international index fund over the past three years. You would have made even more money invested in our Australian Fund over the same period, despite its denomination in Australian dollars. All in all, though, the International Fund has done what it was supposed to do, providing protection from the falling Australian dollar and treading carefully around expensive international stock markets. A return of 14.78% p.a. since inception is nothing to be sneezed at. Its future, however, is going to be very different from its past. As outlined in the Product Disclosure Statement, our aim is the target “undervalued securities on the world’s stock markets” and, by doing so, to outperform the benchmark index. Delivering on that has been difficult in expensive markets. Today, we have three years of experience and a long list of stocks we have been following closely. That put us in good stead when the markets hit the skids in January and February. It also means a natural, and we think optimal, drift away from those global blue chips that served a useful purpose in the early days of the Fund. Some of the largest holdings are now in relatively small companies (see the top 10 holdings in the table below), where we are far more likely to have an edge. Both common sense and experience suggest the most prospective opportunities arise in the lesser known corners of the market. None of this is to suggest that the bottom of global stock markets is behind us. What we have seen so far is a relatively mild bear market by historical standards, with much of it reversed over the past month. We would relish the opportunity to add even cheaper companies to the portfolio. But today’s portfolio is dramatically different to that of just a year ago. In June last year, we wrote a blog piece titled International Ship has Already Sailed. Lamenting the lack of opportunities in international markets, we suggested that, just as Australian investors were heading offshore en masse, the best opportunities were at home. Despite healthy performance in the seven months since then, our Australian Shares Fund still contains plenty of attractively priced stocks. But, for the first time since launch, we are at least as excited about the International Shares Fund. We don’t mean to stoke undue enthusiasm. A healthy degree of scepticism is warranted about our ability to replicate our local skills internationally. As an investor, though, it is important that you know that the portfolio has changed significantly. We have been waiting to put our best foot forward and, now that we have that chance, we are happy to be judged on the next few years’ returns. The wobbly markets of January and February proved fertile ground. We added three new positions to the portfolio—auction house Sotheby’s (NYSE:BID), Italian industrial comany EL.EN (BIT:ELN) and Chinese internet company Baidu (NASDAQGS:BIDU). It was also a good time to rebalance—to increase our investments in stronger ideas and ditch others that had come full circle. We took final profits on some of our bigger past winners, including Flughafen Zurich (SWX:FHZN), Madison Square Garden (NYSE:MSG) and its spin off MSG Networks (NYSE:MSGN). We also sold out of American Express Company (NYSE:AXP). It is one we consider a mistake, and thus deserves explaining. Almost since the inception of the Fund, American Express has been a core holding. A number of factors have caused us to reassess our view of the company. American Express touts its strong brand identity and high-spending cardholders—merchants are willing to pay more to accept Amex as a result—as a virtuous cycle that has been the key to its success. We used to agree. Today, we’re not so sure. It has become more apparent that the competitive dynamics versus the major credit card companies have deteriorated, and the strength of Amex’s virtuous cycle is waning. Want a premium card with premium benefits and customer service? Amex is no longer the only game in town. American Express touts its strong brand identity and high-spending cardholders—merchants are willing to pay more to accept Amex as a result—as a virtuous cycle that has been the key to its success. We used to agree. Today, we’re not so sure. As a result, the company is earning less and less on every transaction it processes. It is losing key partners like Costco, while launching new products aimed at more price-sensitive segments of the market. And it is spending more than it ever has to maintain growth. It was easy to writeoff the initial negative developments as noise, but we have increasingly come to the conclusion that these shifts in strategy indicate a business past its prime. While the stock’s valuation remains less than demanding, more promising opportunities emerged this quarter and we took them. At both the start and end of the quarter, the Fund held 2.2 million shares of mining company South32. (It’s the only Australian stock in the Fund but is also listed internationally and owns a global portfolio of assets.) Over those three months, the stock price rose 38% from $1.065 to $1.465. 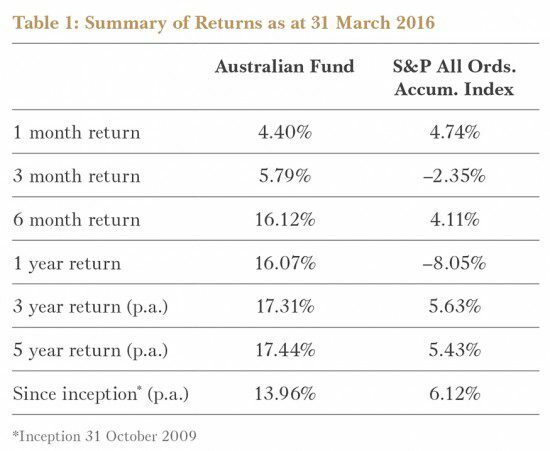 The Fund, however, did a whole lot better than that from the Not-So-Big Australian. We bought another 2.4m shares in the teeth of the panic in mid January at less than $0.95 —a price that looked irrational. We’d sold all of that additional stock by the end of quarter at much higher prices, into what looked like a short covering rally. We don’t aim to be day traders, but volatile, panicky markets create opportunities. In this instance, doubling down at the right time made a meaningful contribution to this quarter’s results. We don’t aim to be day traders, but volatile, panicky markets create opportunities. In this instance, doubling down at the right time made a meaningful contribution to the quarter’s results. A less extreme version of this occurred for the portfolio as a whole. At 31 December 2015, the Fund’s cash weighting stood at 13.7%. At one stage during early February as the market was jittery and cheap stocks were available, cash went below 3%. 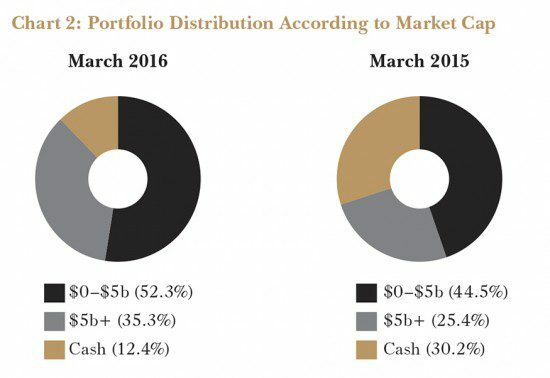 At 31 March, cash was back over 12% of the portfolio as a few more expensive stocks were trimmed or sold. Is cash lazy or is it an important strategic weapon necessary to maximise the value of sharp downturns? Even among our analytical team, we argue over this question – see our recent blog post on the subject. But buying stocks when they’re cheap and conserving resources when they’re scarcer has served us well this quarter and should do so in future. Baidu, Inc is the US-listed, Chinese technology company often described as the Google of China. In many respects, that’s apt—Baidu dominates the search engine market in China as Google does elsewhere. That has been helped by Google withdrawing from China 6 years ago. It’s hard to claim to ‘do no evil’ while allowing the Chinese government to overlord your entire internet infrastructure. Baidu has no such hang ups. Since inception in 2000, the company has grown at a blistering pace under the continuous watch of founding CEO and major shareholder Robin Li. Company-wide revenue growth rates of more than 30% in recent years have been underpinned by explosive mobile-based search growth, where revenue had been growing at more than 100% p.a. until recently (revenue in the most recent quarter grew only 77%), with PC revenues largely flat. For a variety of reasons—not-the-least being the law of compounding large numbers—revenue growth will inevitably slow from here. We expect it to remain impressive for years yet. Sales have grown almost five-fold from 2011 to 2015 as shown in chart 3. So why were we able to buy Baidu in January 2016 at a price almost unchanged from where it traded in 2011? The answer also lies in chart 3. While sales have been growing, profit margins have been contracting. At first glance, it looks like profitless prosperity and makes the stock appear to be trading at an EBIT multiple of 35 times. But it is largely a mirage. Depending on how you split it up, Baidu has three or four main operating divisions, but we’ll consider only two of them here. The most important—which incorporates search and a massive ecosystem that hangs off it, including maps and news—is called Online Marketing. 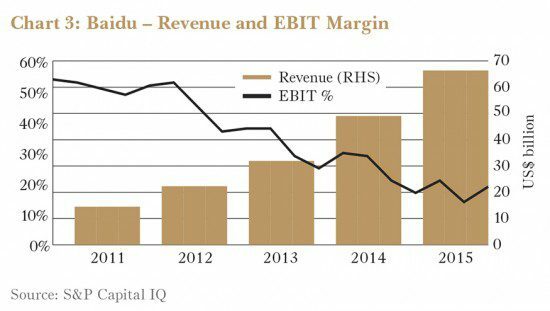 This division provides most of Baidu’s revenue and more than all of its profit. It should generate in excess of US$10bn of sales in 2016 and has extremely fat operating profit margins, a touch over 50%. Baidu’s Online Marketing division is one of those beautiful and rare businesses that needs very little retained capital to grow…and grow. The other crucial division is Transaction Services, also commonly referred to as O2O (online-to-offline). This is a variety of services, mainly app-based, for mobile users. Baidu Nuomi is where you can book a restaurant table nearby and lock in tickets for the 9 o’clock movie afterwards. Baidu Takeout lets you order food for collection or delivery from any of hundreds of restaurants near your home. You can pay for it all, if you wish, using Baidu Wallet. These business have been created from scratch in a very short period of time. Today, they generate very little revenue, and huge losses. More than half that massive and growing profit pile from online marketing is being reinvested in startup losses today—research and development for the new interfaces, coupon discounts for users of Nuomi and Takeout, staffing expenses for businesses that generate minimal revenue and massive content costs for video streaming business iQiyi (the third division). These upfront costs are necessary at the gold rush stage of development of this market; those that don’t incur such costs won’t win. They explain all of the margin deterioration in chart 3. Baidu’s Online Marketing division is one of those beautiful and rare businesses that needs very little retained capital to grow...and grow. It’s important to note that in most Transaction Services markets, Baidu is number two at best, usually a long way behind a competitor owned by Tencent (SEHK:700), Alibaba (NYSE:BABA) or a joint venture between the two. Lacking first mover advantage, Baidu has opted for the ‘late and hard’ approach. With net cash of US$5bn in the bank and a search business that grows largely without the need for reinvestment, it can afford a fight. But the competitors have similarly deep pockets, and in most markets a meaningful first mover advantage. It’s likely that the charge into Transaction Services was partly defensive. Search has become so profitable globally because, compared with every avenue available beforehand, it reduced the ‘friction’ between an idea popping into a consumer’s head and a transaction being processed. That’s why advertisers love it. The mobile market is developing in such a way that other competitive avenues are emerging—all sorts of apps and chat-based technologies—that also translate ideas into transactions. This is happening more rapidly in China than anywhere else. Baidu wants to be part of it. 2. The pace of investment in new businesses will slow, if not in absolute dollars then in percentage terms as the core business grows. Either will allow the core Online Marketing business’s immense profitability to shine again. The stock price is up 20% since the Fund purchased shares in early February, and its market capitalisation at quarter end was US$66bn. Deduct US$5.1bn for net cash, US$4.1bn for its 20.4% stake in US-listed, Chinese-focused travel group Ctrip.com International, US$2.2bn for its 80.5% stake in iQiyi (currently subject to a privatisation offer from Robin Li) and the company’s enterprise value sits a little below US$55bn. Any rational businessperson would come to the conclusion that the Online Marketing business alone is worth significantly more than that, and quite possibly worth more than US$100bn. That leaves a lot of room for missteps in Transaction Services and elsewhere without destroying the investment case. The Fund’s weighting to Baidu is a little more than 4%. It’s far from risk-free. But if time is the friend of the wonderful business, we can afford to stick around to see how this one plays out. It’s worth noting that while the stock trades in US dollars, its business is all transacted in Chinese Renminbi. Any massive devaluation of the Reniminbi would hurt. We’ve largely removed this risk through currency hedging. Both common sense and experience suggest the most prospective opportunities arise in the lesser known corners of the market.